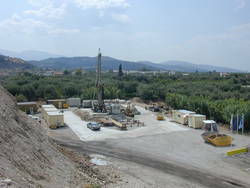 The DGLab project "Deep Geodynamic Laboratory-Gulf of Corinth" will contribute to the development of an European seismic hazard research facility. Its main objective concerns the documentation of hydraulic and mechanical behaviour of faults as well as the acquisition of data required for seismic risk mitigation. The mechanical behaviour of faults will be investigated through the instrumentation of deep boreholes intersecting active faults and designed for obtaining data on the physics of earthquakes and aseismic fault motion. This facility will also include a set of deep permanent seismic sensors to document seismic signals at depth.